Gosh I’ve missed you guys! 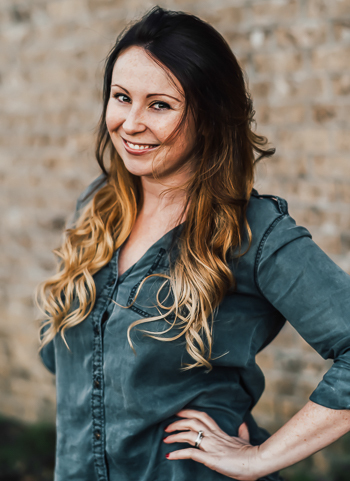 I know it doesn’t seem like it, of course, because I keep choosing the rugrat over you, but trust me when I say I miss the blogging community like a missing limb. You guys are basically the equivalent of a foot to me. Er… that sounds a bit odd. I should have gone with something along the line of a squirrel missing his nuts something a bit less weird. That’s weird too? Well then let’s get down to business! To say thank you for sticking around, I have quite the treat for you today. Not only are these bars insanely delicious, but they’ll save you time and money. Really! All you have to do is squirrel away a cup of leftover cranberry sauce from your holiday celebration and you’re good to go. Boring, forgotten leftovers are a thing of the past! 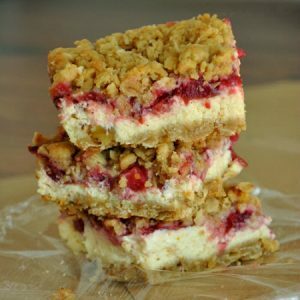 Put your leftover cranberry sauce to good use with these deliciously festive cranberry cheesecake streusel bars! They're quick, easy, and gluten-free too! Butter a 9-inch square baking pan [or skip it and line the pan with parchment paper! ], and set out your cream cheese to soften. In a medium bowl, combine flour [gluten-free or regular], oats, brown sugar, and salt. Next grab a cold stick of butter from the fridge and cut it into the streusel by either chopping into small pieces, grating with a box grater [my method of choice] or using a good old fashioned pastry cutter! This will create the streusel for the base and the topping of the bars. The trick to a good streusel is getting your hands dirty and using your fingers to rub the butter into the flour/oat mixture. I keep squeezing and finger-mashing the mixture until it's nice and crumbly and no leftover bits of dry flour remain. It won't take long at all! Next stir in your chopped walnuts and grab a measuring cup. Measure out 2 cups of streusel and press it firmly into your greased baking pan to make a crust. Once incorporated, add your egg, vanilla, and orange zest and mix to combine. Pour over crust and top with your cranberry sauce. Take the remaining streusel and crumble over the top. Allow to cool completely before cutting into 9-12 squares. These can be enjoyed immediately after cooling or, even better, after chilling in the refrigerator! I adore them chilled. I kept these GF for my friends and family but you can absolutely use all purpose flour in the recipe if needed! It works great both ways!Making these gluten-free? Double check your oats to make sure they're GF certified and you're good to go! If you're using an especially tart sauce and have a bit of a sweet tooth feel free to sweeten your sauce with a few spoonfuls of honey, agave, or sugar. If by some miracle you have leftovers, store in an air-tight container in the refrigerator for up to four days or pop a few in the freezer for a future indulgence. 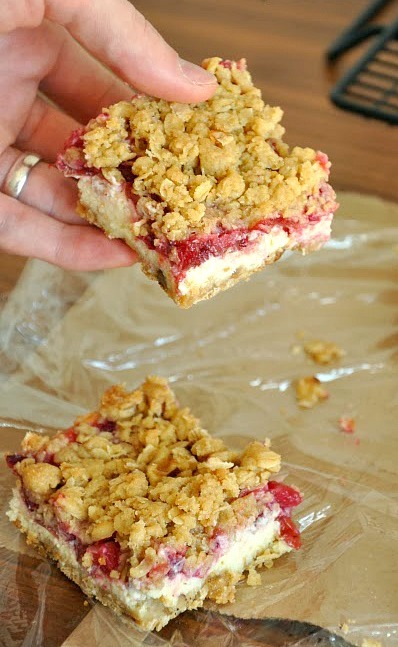 These Cranberry Cheesecake Streusel Bars were a huge hit! I quality-tested three batches (one gluten-free, one regular, and one with double the cheesecake… yeah I said it!) partially because I wanted to make sure my measurements were spot-on and partially because everyone kept eating them all on me! The crumbly streusel is a delicious substitution for the typical graham cracker crust and the zesty, creamy cheesecake is a perfect match for the sweet-yet-tart cranberry topping. The extra streusel on top? Well that just makes me happy. Farewell leftovers; hello deliciousness! 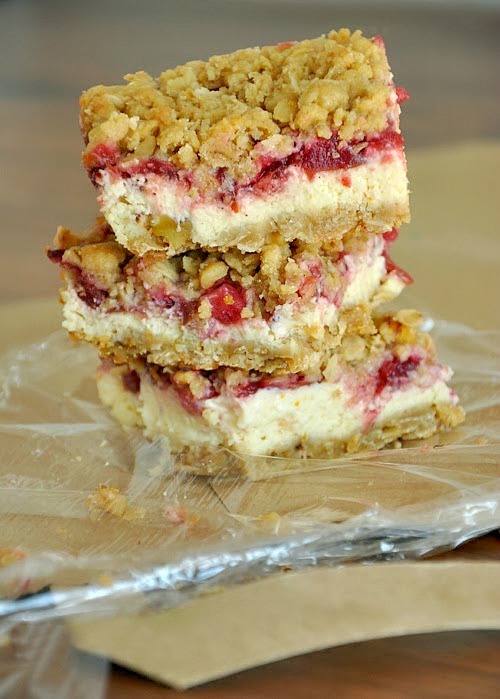 If you get a chance to try these Cranberry Cheesecake Streusel Bars, let me know! You can leave me a comment here (LOVE checking those daily!) or tag @PEASandCRAYONS on Instagram so I can happy dance over your creations. I can’t wait to see what you whip up! Oh man this looks amazing! I know what I’m doing with my pot full of leftover cranberry sauce from Thanksgiving! Oh Jenn!! These look incredible! Love the orange zest you popped in there…cranberries and oranges make for one of the BEST flavor combos out there! And really, this is just a damn genius way of using up leftovers! Confession: I’m not a big cheesecake fan. That being said, these looks like something I’d actually enjoy. Oats, orange zest, butter, walnuts…those are my kind of ingredients. I think I’ll try to nab some leftover cranberry sauce at Thanksgiving. We totally understand that the babe is your priority. How could you not want to spend all your time with her? She’s gorgeous. These looks delicious. I’ve never thought of making cheesecake into handy little bars. Nom! 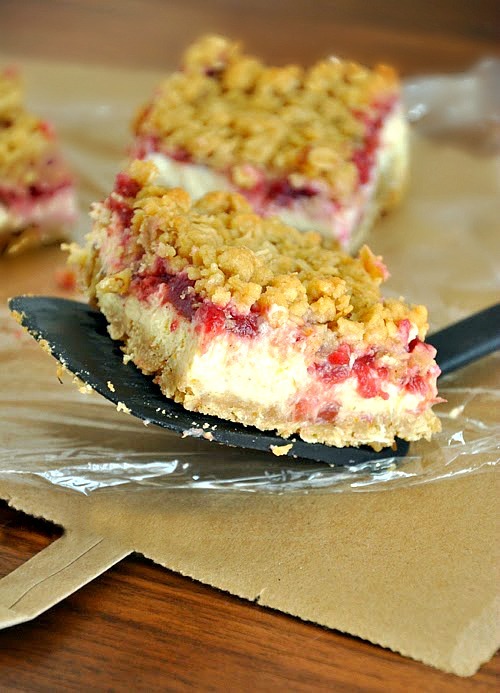 I absolutely love streusel topping AND cheesecake… man but this is just out of this world! Great recipe! I think that’s incredibly cool that you tested out three versions so you would know what to recommend! Although, I can’t help but think that it might have been *partly* because you wanted an excuse to eat these again 😉 Haha. Look great! I’m excited to get baking with cranberries too after I just saw them in the grocery store for the first time last week. Oh darn these would be so dangerous in my house! Already drooling. Thanks for sharing! I have been looking for a recipe to make with my stash of cranberries in the freezer – this is it!! Thank you!!! I want one of the gfree. Por Favor. I think I love you!! Cheesecake is totally my weakness!! That looks amazing!!! I am in love with this cake already! Sadly we don’t really get fresh cranberries here in Germany. Do you think I could make this recipe using cherry sauce or blueberries?